Despite linking up in real time moments after the ending of the previous ‘Fellowship of the Ring’, Peter Jackson manages to give the 'Two Towers' enough of a distinctive tonal shift to differentiate it as its own film. We’re introduced to a whole new bunch of characters in this second part. After the hillside fight with the Orcs which saw the death of the Boromir, the Fellowship finds themselves split up. Frodo and Sam have taken off by themselves with the ring to Mordor, the other hobbits, Merri and Pippin become captured by the Orcs to be taken to Isengard and the evil Saruman, and Aragon, Gandalf, Legolas and Gimli find themselves chasing after Merri and Pippin and fighting the larger battle of middle earth which is encroaching on the lands of men. The most significant advancement in story is the inclusion of Gollum (Andy Serkis), that grotesquely deformed and malnourished creature which had been following the gang through the Mines of Moria. Gollum’s presence is a physical manifestation of the stakes that burden Frodo. As a former Hobbit himself, his transformation into Gollum the demon, is one possible future for Frodo if he doesn’t complete his task. As played by Andy Serkis, Gollum is still a phenomenal achievement – an advancement in performance-based special effects which leap-frogged over anything in George Lucas’s world of CG creatures and still looks believeable 8 years later. The full effect of Serkis’ performance on the character is seen in the special features where we see the physical strenuousness it took to make Gollum flesh and blood. Unfortunately the same can’t be said of the Ent sequence which features Pippin and Merri being carried through the Fangorn Forest by a talking tree for half the picture. It’s the weakest special effects in the series by far, a rudimentary large scale model + blue screen backdrop + some CGI which looked bad then and even worse now. 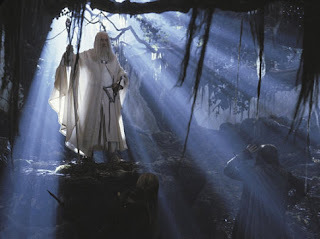 These sequences interspersed with the actions of Frodo and his gang, Aragon, and Gandalf stop the film dead. Stylistically, the tonal shift is complimented with an aesthetic change in colour palette. Gone are the lush greens of the shire and the blue glow of Galadriel’s forest world, instead favouring the dull grey Gollum’s diseased skin and indistinct browns of the depressed environment of Rohan. And we no longer get the cinematic pauses to admire the scenery, the romanticism of the land and creatures giving way to a greater sense of danger and urgency. Jackson admirably ramps up the spectacle of the climax in the ‘Two Towers’ above The Fellowship of the Ring’. I remember originally questioning why Jackson’s climax was so restrained. By the end of the entire trilogy Jackson’s escalation of epic scale was the right move. And so, the final Helm’s Deep battle in TT, it makes for the Army vs. Army battle we never really saw in FOTR. That said, the best part of that scene is the build up, the suspense rung out by Jackson during the preparations. Arguably Jackson’s execution of the fight is more adequate than glorious. As a director of ‘action’ there’s a certain panache missing from his mise-en-scene, a panache which say, Mel Gibson exhibited in “Braveheart”.